No big surprise: Your payment history is the biggest factor in determining your credit score. You must have a fairly good credit score to score a mortgage. And the better your score, the lower the interest rate you’ll have to pay. For a lot of people, a credit score is one of those magic black boxes. Your whole life goes in one side. Magic happens, and your credit score comes out the other side. 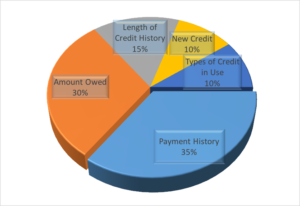 This post is the first of two dealing with credit score. It shows you what comprises your credit score and gives a few useful tips on managing or improving your score. We at Hermit Haus are real estate investors. We are not CPAs, lawyers, or financial advisors. If you need help with your credit score, please consult a professional. For most people, payment history is the biggest part of the credit score. According to mortgage broker Jordan Weimersheimer, the relative importance of these categories can vary for different groups of people—for example, those with a short credit history.